I love italian sweets over everything. But I do realize how much sugar is hiding inside. That's why although traditional italian cuisine is my favourite one, I need to be careful about how much of it I take in on regular basis. And I definitely cannot resist soft almond taste of these tiny amaretti biscuits sometimes. So here is my low sugar version. Let's get onto it! Grease the baking tray with some butter. Whisk the egg whites in an electric mixer until nice and fluffy. Fold in the sugar/stevia, almonds and amaretto liqueur to make a nice smooth dough. Use a piping bag to create nice dollops on a baking tray. Bake in the pre-heated oven for about 25-30 minutes or until golden. After they are done, let them to cool down. 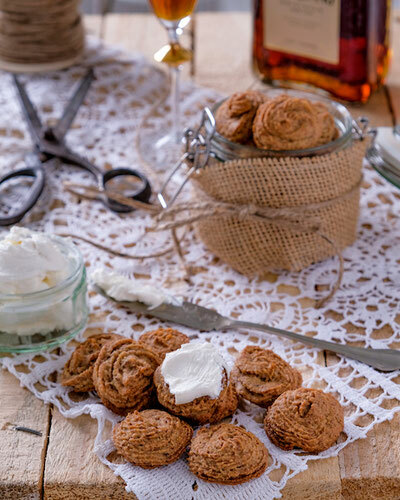 To complement, put some mascarpone cream on a side and enjoy with the amaratti buiscits after the dinner. Optionaly dust with some stevia powder. Enjoy after dinner with a cup of coffee and amareto liqueur without any regrets!